CAIRO Called out by the army, the largest crowds in 2 1/2 years of upheaval filled Egypt's streets Friday, while ousted President Mohammed Morsi was formally placed under investigation on a host of allegations including murder and conspiracy with the Palestinian militant group Hamas. Morsi's supporters also showed no signs of backing down, though they turned out in vastly smaller numbers. 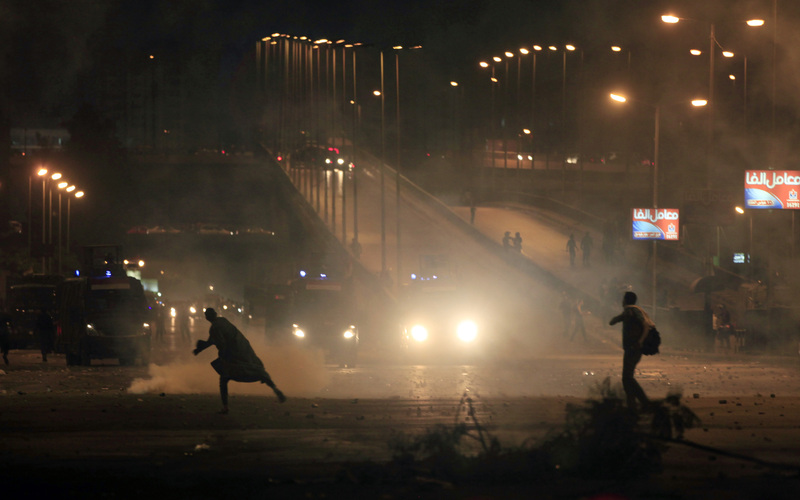 The demonstrations in Cairo were mostly peaceful into the evening. But by late Friday night in Cairo, police fired tear gas to disperse hundreds of Morsi supporters near a sit-in they held for weeks, setting off clashes that lasted into early Saturday morning  in a possible sign of a new intolerance for marches that block city streets. A field hospital doctor said seven protesters were killed and hundreds injured. In the city of Alexandria, seven people were killed and over 100 were injured in clashes between supporters and opponents of Morsi, officials said. The announcement by prosecutors of the investigation against Morsi, which is likely to pave the way to a formal indictment and eventually a trial, was the first word on his legal status since he was deposed by the military July 3. Since then, the Islamist leader has been held incommunicado in a secret location. Both sides tried to show how much public support they enjoy. But the millions who turned out for the pro-army demonstrations overwhelmed the streets in multiple cities in Egypt, including some that rarely seen any rallies since the 2011 uprising. Throngs of people turned out in Cairo's Tahrir Square and in other cities, answering a call by army chief Gen. Abdel-Fattah el-Sissi, who urged them to give him a mandate to stop "potential terrorism" by supporters of Morsi's Muslim Brotherhood. Portraits of the smiling el-Sissi in sunglasses dominated the crowd in Tahrir and one near the presidential palace across town. Posters with his picture were emblazoned with the words "the love of the people," and demonstrators wore small photos of him around their necks or carried a picture of his face on an Egyptian one-pound note. Security was heavy after el-Sissi vowed to protect the rallies from attacks by rivals. Tanks guarded one entrance to Tahrir and police were stationed at other parts. "The army is here to protect the people. They don't lie," said Ezzat Fahmi, a 38-year-old in the crowd. He said el-Sissi called the rallies "so the entire world can see that the Egyptian people don't want the Brotherhood anymore." El-Sissi's plea came at a time when the political standoff with Morsi's supporters showed no sign of resolution. Reporting from Cairo's Tahrir Square, CBS News correspondent Clarissa Ward reportedthat el-Sissi's call for rallies was being interpreted by many as the beginning of a major crackdown on the Muslim Brotherhood. Meanwhile, the allies of the toppled president have held a sit-in outside the Rabaa al-Adawiyah Mosque in Cairo and near daily rallies elsewhere in the capital for three weeks. The rallies have often turned violent, with more than 180 people killed this month. The Morsi supporters and opponents blame each other for the bloodshed, and people in both camps have been seen carrying weapons. The unrest, as well as claims that Islamist groups are stockpiling weapons and escalating attacks against troops in the Sinai, were used by the country's new military-backed rulers as a basis for demanding popular support. The interim leader, Adly Mansour, told the private TV station al-Hayat that his government seeks to include everyone, but it will not accept lawlessness, blocked roads and attacks on state institutions. He urged the pro-Morsi protesters to go home, promising they won't be pursued or arrested. "I can't negotiate with whoever has committed a crime. But those who were duped or those who want to belong to Egyptian society, we welcome them," he said. But he added: "The state must interfere (against lawlessness) firmly." Not long after the speech, police moved in quickly to break up a crowd of Morsi supporters marching on a main overpass in Cairo near the pro-Morsi sit-in, firing tear gas. Clashes with security forces ensued as protesters tried to extend their sit-in beyond the mosque into a main boulevard. Mahmoud Zaqzouq, a Brotherhood official, said a number of protesters had minor wounds. Interior Minister Mohammed Ibrahim told a private TV station that the sit-in at the Rabaa mosque will be removed by legal means. He did not elaborate but said residents of the area have filed police reports against the encampment. Police spokesman Hani Abdel-Latif told The Associated Press that 53 pro-Morsi supporters were arrested around Egypt on Friday in possession of weapons, ranging from knives to homemade guns. El-Sissi deposed Morsi after four days of huge protests by millions of Egyptians demanding the removal of the country's first freely elected president following months of disagreements between him and the largely secular opposition. The accusations against Morsi are connected to a prison break during the 2011 uprising against autocrat Hosni Mubarak. Gunmen attacked the Wadi el-Natroun prison northwest of Cairo, freeing inmates, including Morsi and about 30 other figures from the Muslim Brotherhood. The prosecutors allege Morsi and the Brotherhood worked with Hamas to carry out the break, in which 14 guards were killed. Egypt's MENA news agency said Morsi was being investigated over allegations of collaborating with Hamas "to carry out anti-state acts, attacking police stations and army officers and storming prisons, setting fire to one prison and enabling inmates to flee, including himself, as well as premeditated killing of officers, soldiers and prisoners." In recent months, a court in the Suez Canal city of Ismailia has heard testimony from prison officials and intelligence officers indicating Morsi and his Brotherhood colleagues were freed when gunmen led by Hamas operatives stormed the prison. Morsi supporters called the investigation politically motivated. Muslim Brotherhood spokesman Ahmed Aref said the move showed "the complete bankruptcy of the leaders of the bloody coup." Brotherhood officials have said they escaped when local residents broke into the prison to free their relatives and that they had no knowledge of it ahead of time. Hamas has consistently denied any involvement in the jailbreak. A spokesman for the militant group, Sami Abu Zuhri, condemned Morsi's detention order as "an attempt to drag Hamas into the Egyptian conflict." U.S. State Department spokeswoman Jen Psaki expressed deep concern about reports of Morsi's detention. MENA said Morsi has now been formally detained for 15 days pending the completion of the investigation. It did not say whether he would now be moved to a facility where he could receive family visits. The head of the prison authority, Maj. Gen. Mostafa Baz, said he has not yet received orders for Morsi's transfer to any of his facilities. The news agency indicated that Morsi has already been interrogated. Egyptian institutions lined up behind el-Sissi's call for Friday's pro-military rallies, reflecting the extent of antagonism against the Brotherhood's hold on power in the past year. State TV and most of the private broadcasters showed the pro-army rallies in various cities around Egypt, including aerial footage provided by military helicopters. Nationalist songs and parts of el-Sissi's speech in which he called for support were played throughout the day. On Friday evening, TV networks stopped running soap operas that are wildly popular during the Muslim holy month of Ramadan. In a further show of support, church bells rang out during evening prayers when hundreds of thousands of protesters broke their Ramadan fasts. Interim Prime Minister Hazem el-Belbawi participated in the rally held outside the presidential palace. A giant banner stretched across an entrance to Tahrir Square, the cradle of the 2011 uprising. It read: "The people, the source of all power, mandate the army and police to purge terrorism." Three tanks guarded another street leading into the square, and helicopters swooped overhead. "We have no parliament. Today is a quick referendum to support el-Sissi against the Brotherhood, whose members are terrorists," said Mohammed el-Shaer, who stood in Tahrir holding a portrait of the general in a golden frame. El-Shaer held the hand of his 10-year-old daughter, who was dressed in a military fatigues. He called the rally a "popular referendum" on el-Sissi. In eastern Cairo, tens of thousands of Morsi supporters at the Rabaa mosque sit-in chanted against el-Sissi and vowed to continue their push for the president's reinstatement. Others marched through some neighborhoods of Cairo. Their rallies were mostly covered on TV by Al-Jazeera Mubasher Misr, and pro-Morsi activists emailed journalists videos and links to a live feed. "When I first heard el-Sissi's call I was anxious," said 39-year-old Sayed el-Rawi, protesting outside the mosque. "But today, we saw that his speech encouraged more people to go down in the streets. ... They won't be able to break up the sit in." The rival demonstrations are only deepening the country's divisions since Morsi's fall. Clashes and fistfights broke out between both camps in Alexandria, with seven people killed and over 100 injured, according to health official Ibrahim el-Roubi. Some pro-Morsi supporters took cover inside a major mosque, leading to a standoff with opponents who besieged the place, locking them inside for hours. Skirmishes also broke out in the Mediterranean coastal cities of Damietta and Mahalla, in the southern city of Luxor, and a Cairo neighborhood that left 64 injured, Health Ministry spokesman Khaled el-Khateeb and local security officials said. It remains unclear what steps the military is planning after Friday's show of strength  whether it would try to break up sit-ins by Morsi supporters or attempt to arrest more than a dozen Brotherhood figures who have warrants against them. On the front page of the state-owned Al-Akhbar newspaper, the word "wanted" in English was plastered across photos of a number of Brotherhood leaders and allies who are facing warrants. Many of them are believed to be taking refuge at the Rabaa al-Adawiyah sit-in. The prosecutors' announcement on Morsi also could signal a greater move to go after the Brotherhood in courts. Besides Morsi, five other senior figures from the group have been detained. Hassan Mohammed, a 30-year old teacher who came from southern Egypt to join the pro-Morsi rally, remained steadfast. "Even if we are going to die, me and my family, we won't leave this place before our president comes back. Even if it takes seven years. We are ready to be martyrs in the name of religion and the nation," he said.